In Matthew 5:13-19, Jesus predicts that heaven and earth would be destroyed before the fulfillment of the Law. 2 Peter 3:7-13 indicates that heaven and earth were to be destroyed by fire. When Claudius Caesar adopted Nero, the beast labeled by the 666 gematria,1 as his son and likely successor “a mighty portent occurred[,] The sky seemed to be on fire that day.”2 This omen in the sky foreshadowed and foretold the subsequent destruction of the earth. During Nero’s reign, Rome attacked and burned Israel, the earth, leaving it desolate. After heaven and earth had been destroyed by fire, the Romans demolished the Temple in A.D. 70 as a sign from God that the Law had been fulfilled. 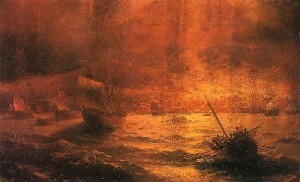 The sky seemed to be on fire the day of Nero’s adoption by Caesar. Matthew 5:13-19 A Preterist Commentary Intro: The most wicked Generation . . . According to Acts 8:1-3, the first century Israelites persecuted their Christian brethren. Addressing the punishment in store for this injustice, Jesus forewarned, “And will not God bring about justice for his chosen ones, who cry out to him day and night? Will he keep putting them off? I tell you, he will see that they get justice, and quickly (Luke 18:7-8).” Revelation 6:9-11 records the pleas of these saints for vengeance. In Revelation 6:11, the departed saints and martyrs are told to wait a little while longer until the full number of their kin have been killed. Soon after, the plagues of Revelation are released. During the thousand years between the Jewish War and the Crusades, Israel grew to become a Christian nation which enjoyed a level of peace that seemed unprecedented in the nation’s lengthy history. A Preterist Commentary on Matthew 5:13: Salt is used by Invading Armies to Scorch the Earth. The Plagues of Revelation are the Answers to the Saint’s Prayers for Justice. 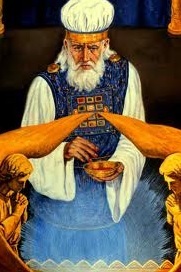 Therefore, the Saints are the Salt of the Earth since their Prayers resulted in the Desolation of Israel. Salt purifies. It is often used by invading armies to scorch the earth making an enemy land unfruitful. Salt is used to make the land desolate in Judges 9:45. Similarly, the fact that salt and fire would be used by Israel’s foreign enemies to make the land fruitless and desolate is prophesied in Deuteronomy 29:23: “‘All its [Israel] land is brimstone and salt, a burning waste, unsown and unproductive, and no grass grows in it, like the overthrow of Sodom and Gomorrah, Admah and Zeboiim, which the Lord overthrew in His anger and in His wrath [emphasis mine].’” The destruction of Israel by fire is also predicted in 2 Peter 3:5-13. In Revelation 8:4-5, the prayers of the saints rise to heaven. And God answers their prayers by dispatching seven angels to release the seven plagues of Revelation. These seven plagues resulted in several tragic battles throughout the Jewish War and a catastrophic civil war in Rome. After the war, thousands of Israelites were killed and exiled and much of Israel was left barren. 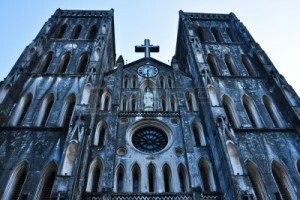 The prayers of the saints had purged the land of the wicked as salt purifies the earth. A Preterist Commentary on Matthew 5:14-16: The Miraculous Light on the Hill in A.D. 66 . . . The Law is prophetic. For example, the custom of the daily sacrifice foreshadows the sacrificial death of the Messiah for the sins of the world. A Preterist Commentary on Matthew 5:17: The Law is Prophetic. 18I tell you the truth, until heaven and earth disappear, not the smallest letter, not the least stroke of a pen, will by any means disappear from the Law until everything is accomplished. 19Anyone who breaks one of the least of these commandments and teaches others to do the same will be called least in the kingdom of heaven, but whoever practices and teaches these commands will be called great in the kingdom of heaven. “When Claudius adopted Nero and had made him his son-in-law . . . a mighty portent occurred. The sky seemed to be on fire that day.” Was this the destruction of heaven by fire predicted in Matthew 5:18 and 2 Peter 3:7-13? A Preterist Commentary on Matthew 5:18: The Earth Represents Israel. Before commenting further on these verses, it is important to define what Jesus means by earth as it is used in v. 18. The word earth in v. 18 is often used like land in the Bible. Here it refers to the land of Israel (see In the Bible “Earth” Signifies the Specific Land Addressed While “Sea” Symbolizes Foreign Nations). In light of this evidence, it is the belief of this author that the destruction of the earth primarily refers to the destruction of Israel. 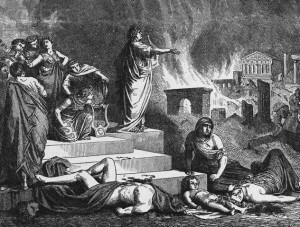 During the Jewish War much of Israel was set ablaze as part of Rome’s scorched earth policy. The burning of Israel, the earth, fulfills Matthew 5:18 and 2 Peter 3:7. A Preterist Commentary on Matthew 5:18: Israel, the Earth, was destroyed by Fire. John sees every mountain and island being removed from its place. As a result, the earth is left formless and void as it was before its creation in Genesis 1:2. These verses describe the destruction of the earth. From A.D. 66 to A.D. 70, the Roman army invaded Israel. As a result Jerusalem was completely destroyed such that “there was left nothing to make those that came thither believe it had ever been inhabited.”8 The fate of Jerusalem reflected the condition of Israel as a whole after the war. 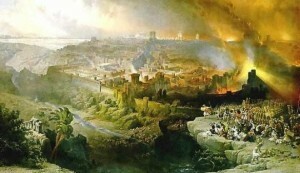 As the Romans marched throughout Israel, they demolished all the fortified cities that resisted their advance and set fire to the surrounding countryside.9 As a result, the Temple was demolished and the land was left barren resembling the earth at its creation—depopulated, without form, void and desolate. 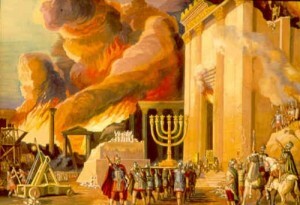 The Romans demolished and burned both Jerusalem and its Temple in A.D. 70. A Preterist Commentary on Matthew 5:18: As a Sign of the Fulfillment of the Law, the Romans Demolished the Temple in A.D. 70 making it impossible to fully practice the Law. The Temple was the nucleus of the Law. With the Temple destroyed, the Jewish people could no longer carry out the full requirements of the Law. This event marked the end of Temple sacrifice. Never again would the Jewish people offer animal sacrifices to God. The destruction of the Temple was the ultimate sign that the Law had been fulfilled. In Matthew 5:18 Jesus predicted, “[U]ntil heaven and earth disappear, not the smallest letter, not the least stroke of a pen, will by any means disappear from the Law until everything is accomplished.” With heaven and earth destroyed, the Law served its prophetic purpose and faded away. After the fall of Jerusalem and the destruction of the Temple, the Flavians celebrated a triumphant parade through the streets of Rome in celebration of their victory. During this triumph hostages and valuable and priceless spoils were marched and paraded through Rome. And as a clear sign and testament of the end of the Law of Moses “the last of all the spoils, was carried the Law of the Jews.”10 For a detailed explanation of what the expression “the destruction of heaven and earth” means in the Bible, how this expression had been fulfilled in Old Testament history and how the prophecies concerning the destruction of heaven and earth had been fulfilled surprisingly literally in the first century see The Destruction of Heaven and Earth and the New Heaven and Earth Explained. A Preterist Commentary on Matthew 5:18: In A.D. 70 Biblical Judaism died triggering the Birth of Rabbinic Judaism and Christianity. Before the fall of Jerusalem in A.D. 70 Christianity was a sect of Judaism. After the destruction of the Temple in A.D. 70 a new age began. This defining moment in Biblical history is what modern historians believe was the final straw that ultimately caused the schism between Christianity and Judaism. 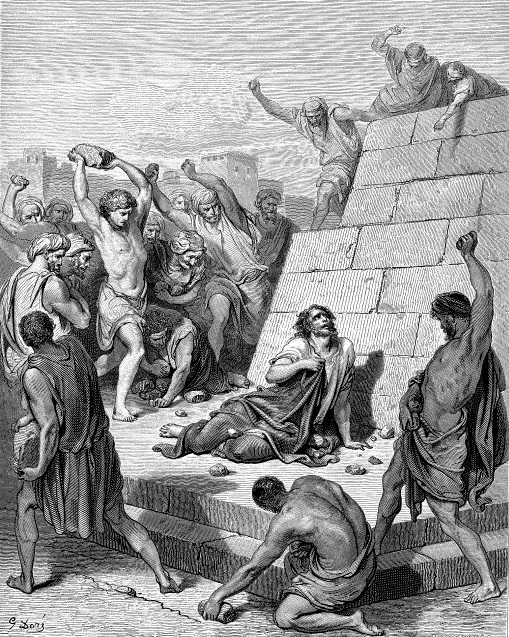 With Temple sacrifice abolished, Biblical Judaism died and a modified form of the religion adapted to this national tragedy called Rabbinic Judaism was born. As both faiths simultaneously separated themselves from their common denominator, two entirely separate and distinct religions emerged. As shown in the above Preterist Commentary on Matthew 5:13-19 heaven and earth were destroyed by fire before the fulfillment of the Law in A.D. 70. Cassius Dio Roman History 60.22. Teddy Kollek and Moshe Pearlman, Jerusalem: A History of Forty Centuries (New York: Random House, 1968), 149. Interestingly, in Wars of the Jews, Josephus records a miracle that appears to foretell the coming Christianization of Jerusalem. In A.D. 66 a mysterious light beamed from the Temple. This light was so intense that the city of Jerusalem was engulfed in so much light that it appeared to be midday at the ninth hour of the night. 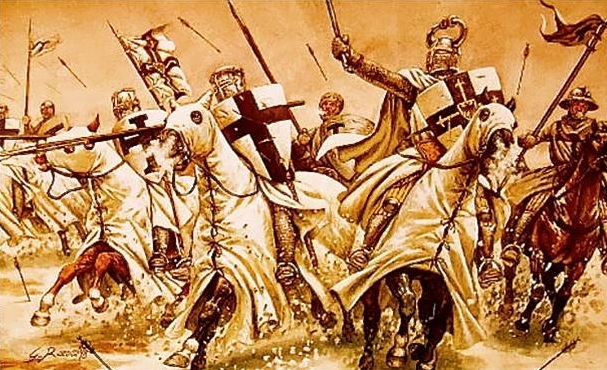 For half an hour, Jerusalem shone like a lamp penetrating a world of darkness. This light foreshadowed the renewal of the land. 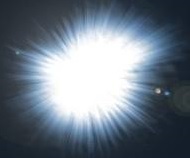 Like the light of Genesis 1:3, this light marked the creation of a new earth. Jerusalem was soon to be purged of the wicked generation who had killed the Messiah and His people and repopulated by the Christian saints pictured by the lampstands in Revelation 1 (see the preterist commentary on Revelation 20). Ibid., 5.6.2; 4.8.3; 3.4.1; 4.9.7, 6.1.1.